You are here: Home / Blogs / To be draped in a kira, you got to wear it first! To be draped in a kira, you got to wear it first! 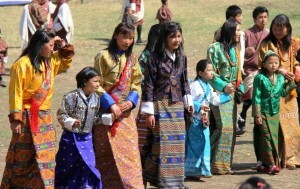 The national dress for women in Bhutan is the kira. It is a rectangular piece of cloth (hand-woven or readymade) that is wrapped around the body and pinned at each shoulder by clasps or brooches called komas. An inner blouse called the wonju and an outer jacket called the tego is worn to complete the outfit. Similar to the gho, the ankle length kira is held at the waist by a flowery patterned hand-woven belt or kera that separates the upper and lower folds of the long elegant dress. The upper half, like the gho, serves as a pocket. But, unlike the men, women use broader and colorfully woven waist belts which allow them to display their waists. Since it was first introduced in the 17th century by Zhabdrung Ngawang Namgyal, the kira has undergone a sea change. Today, half kiras are in vogue and much sought after by the masses. These minimized kiras that are easier to put on permit women to reveal their wonju collar more fully in the absence of tightening komas while offering a respite from the heat. But, the elegance of a full kira is something altogether and requires craft and practice to perfect. First, the kira is draped around the back under the right arm. Then, it is wrapped around the front and fastened on the left shoulder with a koma. Now comes the part where skill is required as you fold the kira left to right at the front. That done, fold it right to left and gather the remaining cloth under the left arm to wrap it around the back at the right shoulder to secure it with a second koma. Once the kira is fastened at the shoulders with the komas, tie it at the waist with a kera to form a pouch above the belt. Put on your tego over the kira and fold the sleeves of the wonju with the tego to form cuffs. 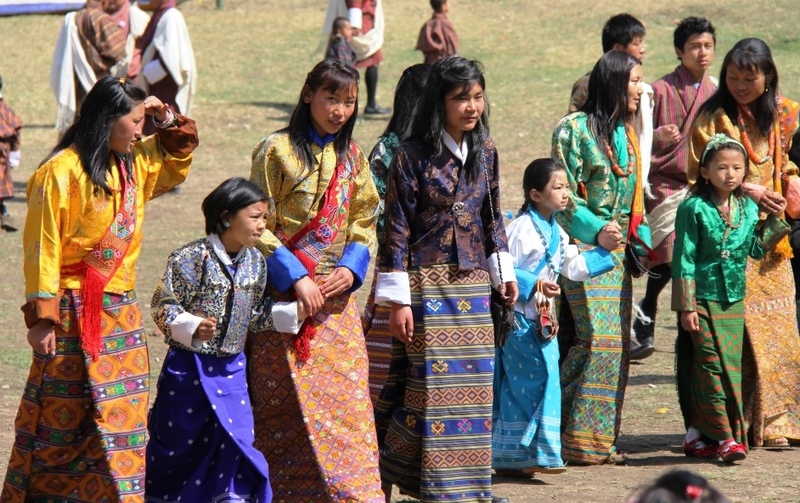 Like the scarf or kabney worn by men, women wear rachus on the left shoulder when visiting monasteries, dzongs or other administrative centers. The scarves vary in color and signify the wearer’s status or rank.